New year, new events guide! The festive season is at an end: turkey has been digested, family has been visited, and the nebulous melancholy that haunts many of us during that strange period between Christmas and New Year overcome. 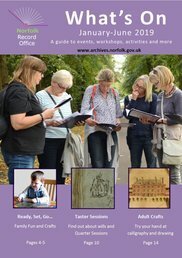 And yet, one more present awaits: that's right, the new What's On guide detailing events at Norfolk Heritage Centre, Norfolk Record Office and King's Lynn Borough Archives is now available! Packed to the gills with talks, activities and workshops, it can be browsed online here, or alternatively picked up in its physical manifestation at any of the aforementioned venues, as well as libraries across the county. To book a spot on many of the events included, visit our Eventbrite page here. In December, we were delighted to welcome Kate Cooper and Fiona Sinclair from the Suffragette Stories project, a partnership between Norfolk Library and Information Service and University of East Anglia Archives. They led an inspiring session that saw members of our History Hunters group for 8-14 year-olds interview some of our 'Time Travellers' (members of our regular reminiscence group for older people) about the suffragettes' legacy and its impact on their lives. Thank you to everyone who took part. Opportunity for budding young curators! 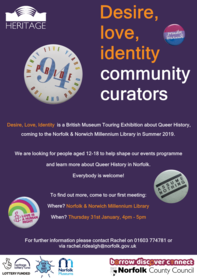 This summer, the Norfolk and Norwich Millennium Library will be hosting 'Desire, Love, Identity', a British Museum touring exhibition exploring LGBT+ history. As part of this project, we're delighted to be able to offer an opportunity for people aged 12-18 to participate as community curators. If you know someone who would like to help shape an exciting events programme and learn more about LGBT+ history in Norfolk, contact Rachel Ridealgh on 01603 774781 / rachel.ridealgh@norfolk.gov.uk. During 2018, we were delighted to be involved with the Change Minds Norwich project, hosting, along with Norfolk Record Office and Norfolk Museums Service, research sessions and creative workshops for people who live with mental health issues. 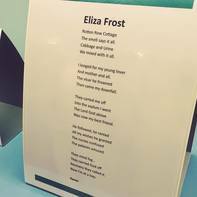 From 8th to 29th January, an exhibition of the resulting poems, artwork and research, inspired by records of patients at St Andrew's Hospital (Norfolk County Asylum) in the 1880s, will be on display in the Norfolk Heritage Centre and on the ground floor of the Norfolk and Norwich Millennium Library. On 10th January, 10.30am-12 noon, there will also be an opportunity to meet project staff and participants at a celebration tea party on the library ground floor. For more information on Change Minds, visit www.changeminds.org.uk.